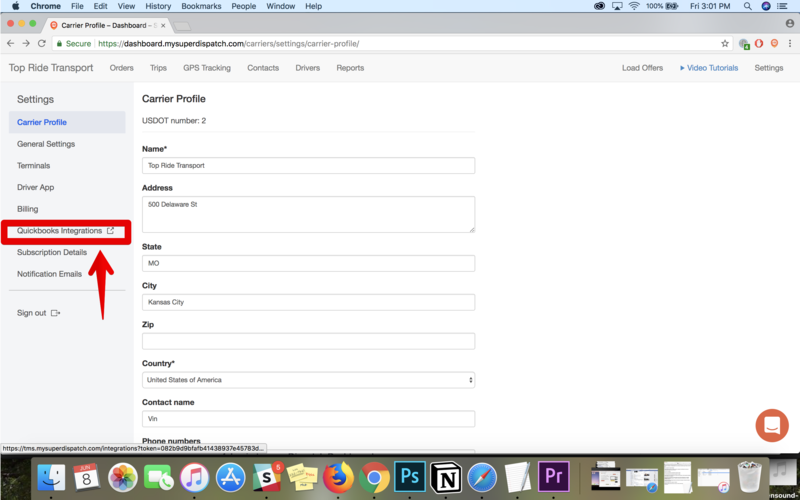 By connecting Quickbooks Online with your Super Dispatch dashboard, invoices that are generated after loads are delivered are automatically sent to your QuickBooks chart of accounts. The way this works is that every time an invoice is generated and sent from the Dashboard, the same invoice is created in Quickbooks online. Once payment is received for the load, and is marked paid on the Dashboard, the respective Invoice in QuickBooks online is also updated. This helps you eliminate the need for manual data entry to create Invoice manually for each delivered Load. Login to your Dispatch Dashboard. Go to your "settings" page. 4. Please read the introduction text and click to Get started. 5. Please read the instruction and click to the "Connect QuickBooks Online" button to connect your QuickBooks Online with Super Dispatch. 6. Please click to the "Authorize" button to authorize the sharing of your data between Super Dispatch and QuickBooks. 7. Once you click the Authorize, the QuickBooks securely will transmit your data to Super Dispatch. 8. Congratulations! Now, you are connected to QuickBooks Online. Please select a Service Item to sync your invoices. The Service Items list is automatically uploaded from your QuickBooks Online. 9. Please note, you can also Import the list of your contacts from Quickbooks Online by clicking Import contacts. 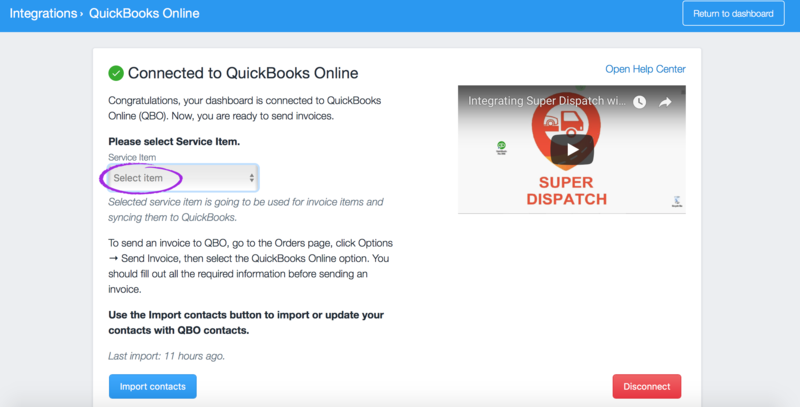 Your Super Dispatch Dashboard is now connected to your QuickBooks Online account. Now you can send your invoices to QuickBooks Online from your dashboard.